Author: Davidson, Robyn Set In . . . The incredible true story of one woman’s solo adventure across the Australian outback, accompanied by her faithful dog and four unpredictable camels. I arrived in the Alice at five a.m. with a dog, six dollars and a small suitcase full of inappropriate clothes. . . . There are some moments in life that are like pivots around which your existence turns. For Robyn Davidson, one of these moments comes at age twenty-seven in Alice Springs, a dodgy town at the frontier of the vast Australian desert. Davidson is intent on walking the 1,700 miles of desolate landscape between Alice Springs and the Indian Ocean, a personal pilgrimage with her dog—and four camels. 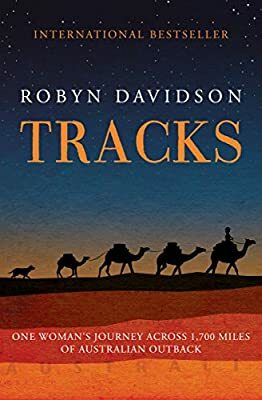 Tracks is the beautifully written, compelling true story of the author’s journey and the love/hate relationships she develops along the way: with the Red Centre of Australia; with aboriginal culture; with a handsome photographer; and especially with her lovable and cranky camels, Bub, Dookie, Goliath, and Zeleika. Adapted into a critically acclaimed film starring Mia Wasikowska and Adam Driver, Tracks is an unforgettable story that proves that anything is possible. Perfect for fans of Cheryl Strayed’s Wild.